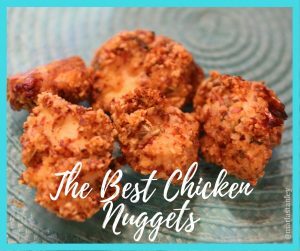 The BEST Healthy Chicken Nuggets Ever…& My Kids Actually Eat Them! So, yes, we do indulge from time to time and hit up Chick-fil-A. However, we are also playing by War on Debt/FPU rules, which means BUDGET. This means those trips are once a month and pretty limited. I set out to find a chicken nugget recipe that was A-mostly healthy, B-quick and easy and not 25 steps. (‘Cuz ain’t no momma got time for that!!!) and lastly, C-that my kids actually liked and would eat. NOTE: I did make a few adjustments to Lexi’s original recipe that suited my kiddos tastes (see her link for the original). These included omitting the cayenne pepper and crushed red pepper. My husband and I liked those, but the kids prefer the milder version. You can also make these as chicken strips, but may require longer cooking. The BEST way to judge that is by using a meat thermometer for checking.